We welcome you to IIMC! Here is how to find us. You can also send us an email. Tollygunge, Kolkata – 700040, India. Kolkata – 700150, West Bengal, India. From Airport – Airport – VIP Road – Ultadanga – Science City – E. M. Bypass – Garia –kamalgazi –Sonarpur Station Road- Tegharia Shani Mandir – IIMC Head Office. From City Center – By any transport To GARIA – By Auto Rickshaw towards Sonarpur & get down at Tegharia Shani Mondir – IIMC Head Office. From Garia – By Auto Rickshaw or Bus towards Sonarpur & get down at Tegharia Shani Mondir – IIMC Head Office. 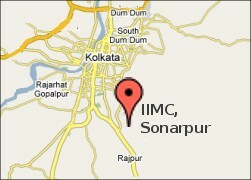 From Sonarpur Station –By any Transports towards Kamalgazi & get down at Tegharia Shani Mondir – IIMC Head Office.